With the longest government shutdown in United States history over, the country turns its attention to the conference in which selected members of Congress will negotiate a final spending bill for the Department of Homeland Security (DHS). The stakes are high. The outcome will impact the lives and safety of immigrant communities throughout the United States and asylum seekers seeking safety at our borders. The final bill will also be viewed, in the United States and throughout the world, as a reflection of our national values. Below are three principles that should govern these critical negotiations. 1. 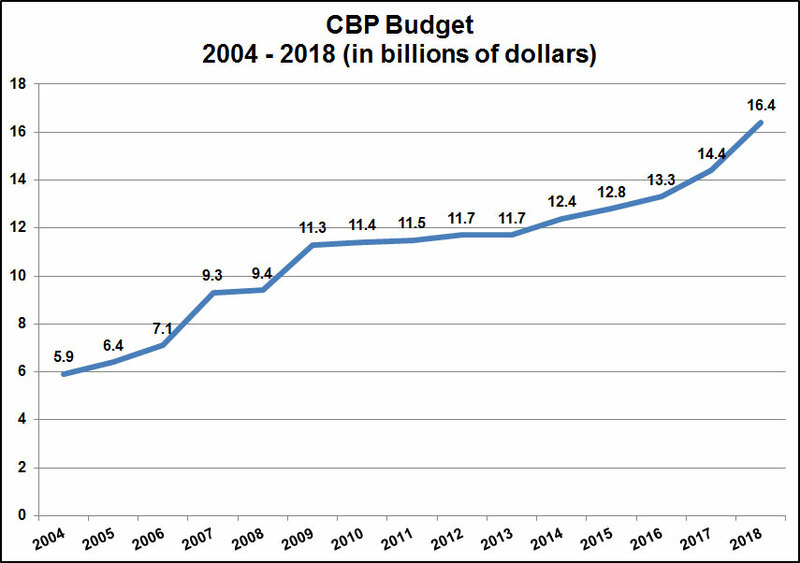 Detention and enforcement budgets for Immigration and Customs Enforcement (ICE) and Customs and Border Protection (CBP) already are at unprecedented highs, and must be cut. These negotiations begin with ICE and CBP’s budgets totaling $24 billion in taxpayer dollars, a historically unprecedented high. 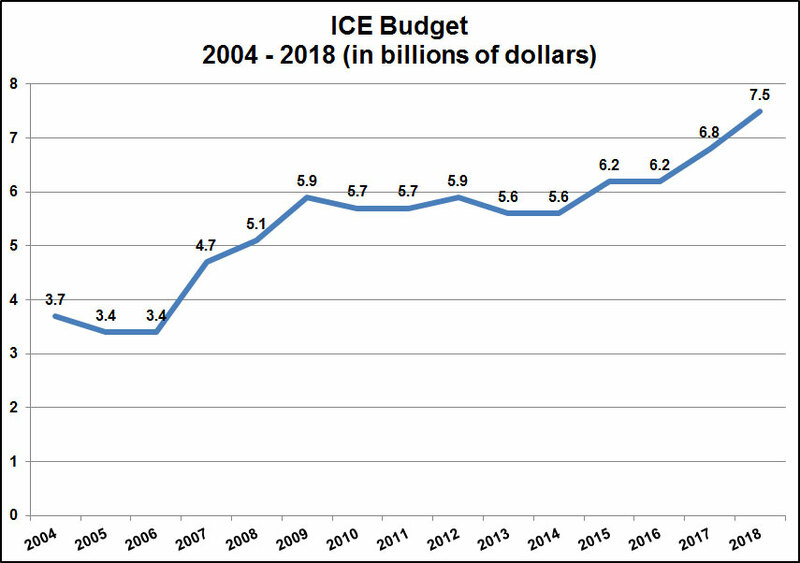 CBP’s budget has nearly tripled since DHS’s inception in 2003 and ICE’s has more than doubled (see charts at right, sourced from DHS’s Budgets in Brief and the 2018 DHS Appropriations Act). The agency’s funding has increased while border apprehensions have significantly decreased, with hundreds of thousands fewer people crossing today than decades ago. Ironically, even with these massive budget increases, CPB has struggled to hire agents. Experts warn that efforts to grow the force is making the agency’s infamous culture of corruption and abuse even worse. ICE’s immigration detention system has grown by 40 percent just since Trump’s inauguration, with vast sums flowing to private prison companies with histories of abuse and corner-cutting. ICE’s reckless expansion of its network of jails and enforcement operations and CBP’s increasingly militarized force exertion on the southern border cause serious harms that must be reined in. DHS’s own Inspector General has sounded alarm bells regarding DHS’s failure to provide a safe environment for people it detains. Immigrants in detention endure sexual abuse and involuntary labor and struggle to communicate with their loved ones and lawyers in remote jails. At the southern border, CBP agents are implementing the Trump administration’s orchestrated effort to close the border to those seeking safety, illegally turning back asylum seekers and imposing an arbitrary and unnecessary “metering” system that leaves refugees stranded and vulnerable in Mexico. In the interior, CBP is brazenly expanding its zone of militarization through the use of disruptive interior checkpoints. Refusing to grow the budgets that fuel these abuses is no longer enough; it’s time for significant cuts to funding for detention beds, agents, and interior and border enforcement. 2. In any spending deal, Congress must hold DHS accountable to agreed-upon spending levels by limiting the agency’s authority to transfer or reprogram money toward building the wall, new detention facilities, or enforcement programs. In a credible threat to democratic checks and balances, DHS has become extremely effective at manipulating the appropriations process to grow its detention and enforcement machinery. Sections 209 and 503 of the DHS Appropriations Act provide the agency wide discretion to transfer and reprogram money toward its political priorities, and DHS has taken unrelenting advantage of this to grow its detention system in violation of congressional intent. Just last summer, ICE moved more than $200 million into its detention and removal account from other accounts including the Federal Emergency Management Agency and the Coast Guard. All told, this chicanery has allowed ICE to grow its detention and enforcement budget by nearly one billion dollars (from $3.2 to $4.1 billion) in just two years. This pattern is now echoed in the president’s threats to pull billions of dollars from other agencies including the Department of Defense to build his wall. The only effective way to end this cycle of harmful spending beyond congressionally imposed limits is to include statutory language in DHS’s spending bill sharply limiting its ability to reprogram or transfer funds into detention and enforcement accounts or toward construction of physical barriers on the border. 3. Congressional report language is critical for imposing safeguards and reporting obligations, but is not sufficient to hold DHS accountable for abuses. DHS has repeatedly demonstrated under the Trump administration that it is willing to blow past deadlines and ignore obligations imposed by congressional report language. In December, under intense pressure from civil society and Congress, ICE finally published a web page purporting to comply with congressional reporting requirements regarding in-custody deaths; yet the reporting excluded three deaths that had occurred within the required reporting range and those that were posted were entirely insufficient by any expert’s standards. These sham death reviews are only one example of numerous failures by the agency to comply with the letter and/or spirit of congressional reporting obligations. Other recent examples have included posting ICE detention facilities lists that omit entire facilities and failing to provide congressionally mandated protections against sexual assault in custody. Moving forward, obligations put forward in reports and explanatory statements that accompany congressional budgets must be accompanied by stringent oversight mechanisms, and critical obligations should be in statutory text. Civil society continues to report that approximately half of all deaths in ICE custody are attributable to negligence. Whistleblowers warn that conditions in DHS custody are so punishing that Jakelin and Felipe, who recently lost their lives in CBP custody, will not be the last children to die there. In the case of the DHS budget, where and how dollars are spent is literally a life and death matter. Heidi Altman is NIJC's director of policy. For questions about this blog post, contact her by email or at 312-718-5021.